One of the benefits of working on a NASA Center is the easy access to seminars and colloquiums on topics I would never seek out if I were working somewhere else. I blogged a while back about "why humans can't tickle themselves". That was the outcome of a seminar at work. Here is another one. I attended a scientific seminar yesterday on the Antikythera Mechanism. I didn't have a clue about what it was but the seminar description mentioned a ship wreck, ancient Greek artifacts, advanced astronomical computations as well as state-of-the-art imaging techniques. Sounded like a great mystery to me and given that it was Friday afternoon before a long weekend, I wasn't going to be missing that many calls or emails. By the time I reached the auditorium where the seminar was being given, there were very few seats left. That was my first clue that the audience knew much more than me about what the Antikythera Mechanism than me. The Friday seminars are usually well attended, but nothing like a full auditorium. It turned into standing room only, with people sitting on steps and standing in the back. This turned into a fascinating talk. Of course, I'm neither an astronomer, an archeologist, a mechanical engineer or anything remotely capable of understanding the technical details of what the presentation was about, yet the impression I came out with was that 1) some ancient Greeks were real geeks who appeared to have been way ahead of their time; 2) their user's manual is turning out to be quite useful 2000 years later; 3) people can develop advanced technologies when it addresses issues critical to their culture; 4) this has all the elements of a great plot for a novel or a movie. Think about it, 2000 years from now, someone somewhere finds something that's 2000 years old and they can't figure out what it could have been used for because "humans in 2010 were quite primitive." Sort of a "Planet of the Apes" adaptation. 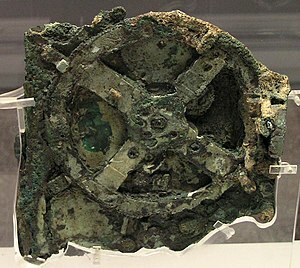 A range of people have been trying to solve the mystery of the Antikythera mechanism since it was discovered in 1902. However, it is only in recent years that new imaging technologies have made it possible to fully examine the mechanism's interior and to decipher many parts of the "user's manual." See The Antikythera Mechanism in Lego.